Mick and the kids had a three week break from school, and we decided to make the most of it! Since Mick agreed to living in the mountains of Guatemala, I'd promised her the beach for Christmas. But where? We've been to the Pacific Coast of Guatemala twice and love it, but we wanted something different. Something outside of Guatemala. I began researching and found exactly what we were looking for. Cheap flights from Guatemala City to Panama City and a country with 5 Marriotts. Our flight was not direct. We had a brief stop in the airport in Costa Rica. The kids were in good spirits (most of the time), and especially enjoyed the shuttle ride on the taxiway to our puddle jumper. Surprisingly, after our long road trip this summer, we still have some Marriott Rewards points left. We decided to use points for 4 nights in Panama City and cashed in an additional 2 more free nights. This gave us 5 full days to explore the city and enjoy the benefits of better-than-third-world shopping. There was a mall and food court next door! The kids enjoyed the workout facilities at the hotel. The mall next to the hotel was huge and full blown American. They had all the mid-upper end stores you see in the States. Outside of the difference in language, you'd think you were in the States. With Christmas fast approaching we needed to get our annual Santa pic and the mall obliged. Three times actually. The blue Santa was somehow related to the movie Frozen. You just can't escape that movie. Before leaving Panajachel, Mickelle was joking that our best Santa picture option this year would be with the blow-up Frosty the Snowman in front of the local grocery store. Panama's currency is the Balboan and the US dollar. We'd pay for something in dollars and receive a $1 US bill and an equivalently valued $1 Balboan coin as part of our change. Balboan and US coins share the same size and composition. Our first big outting was a visit to the original part of Panama City (called Casco Viejo). Since we did not have a car until later in the trip we took a taxi. Transportation around the city was one of our least favorite features of Panama City. The traffic was horrendous. The driver put on a DVD for the kids. NOTE, there's a screen where the rear view mirror would normally be. Casco Viejo is currently in the midst of a major revitalization. About half the of buildings have or are being refurbished. The architecture reminded me of a cross between the French Quarter in New Orleans and the Bahamas (which kinda works historically and geographically). Kids were playing basketball and soccer literally on the water. Both courts appear wet in the photos because it had just rained. If Tag and I had turned around (top right photo), we'd be looking at the President's House. Although we couldn't knock on the door, we were within a 100 feet of the actual house. Naturally, there were security guards around. The neighborhood was very cool. There was a lot to see culturally. But after a while the kids got tired of walking the neighborhood and began to balk. At one point they both refused to leave this deck. Tag proclaiming he's done walking. So we did what all good vacationing and desperate parents do...we bribed them with food. The neighborhood had all kinds of cool places to eat. Mickelle and I loved the ice cream at this top-rated TripAdvisor suggestion. We wrapped up the day in a park overlooking the city. Panama City has an impressive skyline, only part of it is visible here. Did I mention it was hot! No trip to Panama City would be complete without a trip to the Panama Canal! 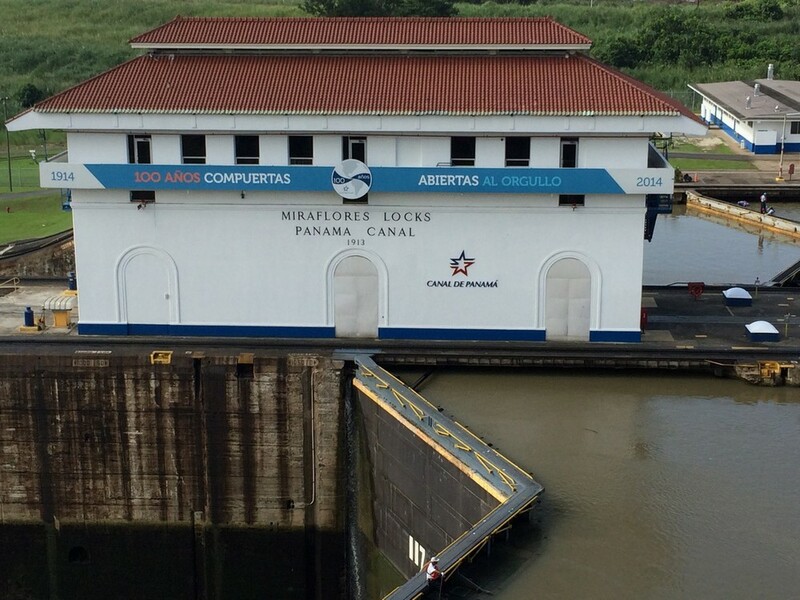 We went to the Miraflores Locks. Seattleites be warned, for security reasons you can not get as close to these locks as you can to the Ballard Locks where anyone can walk across them and practically touch the boats. This is the line to get into the Canal's Museum and viewing station. It was early and the kids were not happy...but they recovered. They really like it when we take pictures of them grumpy! The Canal celebrated its 100th year of operation in 2014. It's crazy to think that we had the engineering foresight to build the locks this big 100 years ago. A very large boat going through the Canal. Cruise Ships pay as much as $500,000 for one passage. See the waterway behind it? That is part of the expansion project of the Canal. It is scheduled to open in late 2015. We also took a trip to Ancon Hill which provides incredible views of the city. Panama City from a top Ancon Hill. Lastly, I had the chance to get a few runs in during our stay in the City. With sidewalks that randomly appear and disappear it's not the most pedestrian friendly city but I did find a few good spots to run. The park behind me was finished only a few months before our trip. It's very nice and was built using landfill from the Canal expansion project. Next up, our trip down the Azuero Penisula for Christmas and some solid beach time. My Class in a Pick-Up Truck!